XPAND Code is going to be the foundation for how display information on smartphones. Like QR Code and JAN Code/Barcode, it works via scanning. When you scan the XPAND Code with your smartphone, it can then display additional information. Ex: You scan an XPAND Code on the information board in a train station, and then your smartphone displays the train departure information. 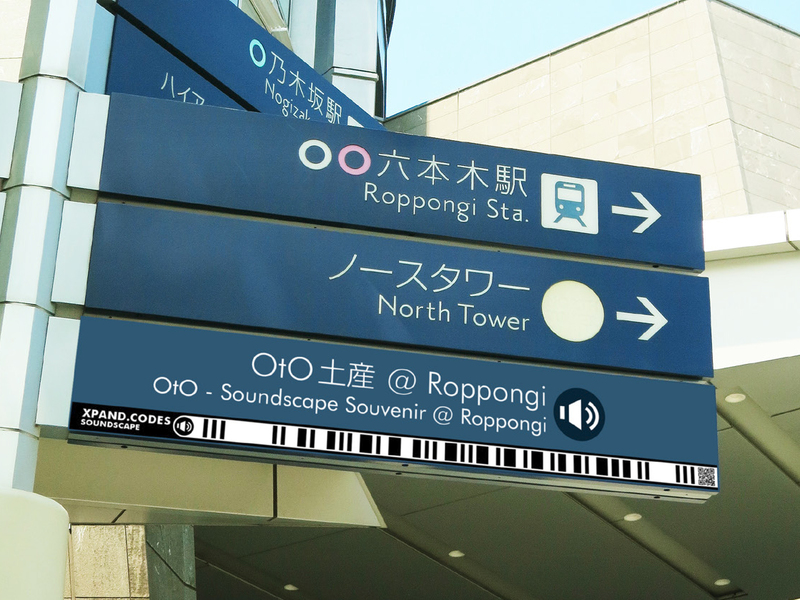 By displaying information from guide boards and signs with your smartphone, more information can be provided to users. In addition, the information is displayed in different languages in accordance with the language settings on the smartphone allowing for smooth translation to multiple languages. The XPAND Code is made for surface read from a distant position, like a type of hanging or wall-mounted signboards and signs. Additionally, the barcodes are designed to be slender so as to not get in the way of the main content on a display. So as you can see, “XPAND.CODES” refers to the whole package of redesigned barcode specifically made for signs and the smartphone display solutions. The widely used the QR Code was designed to be scanned at a close distance, such as documents, reports, and leaflets. Therefore, in order for the QR Code to be scanned from a long distance such as signs to be posted on the head, it would need to be appropriately enlarged. The horizontal slit-shaped XPAND Code, which was created with sign design in mind, effectively utilizes the sign space and provides expanded information in harmony with the rest of the design. The QR Code, which fails to properly use a sign’s limited space and clutters it with a noisy design cannot help but feel largely unnecessary. However, the XPAND Code and the QR Code are not meant to compete with each other. In truth, the currently released applications for reading the XPAND Code also support the QR Code. Using the XPAND Code and the QR Code in tandem is the most powerful solution for tying together signs and internet. 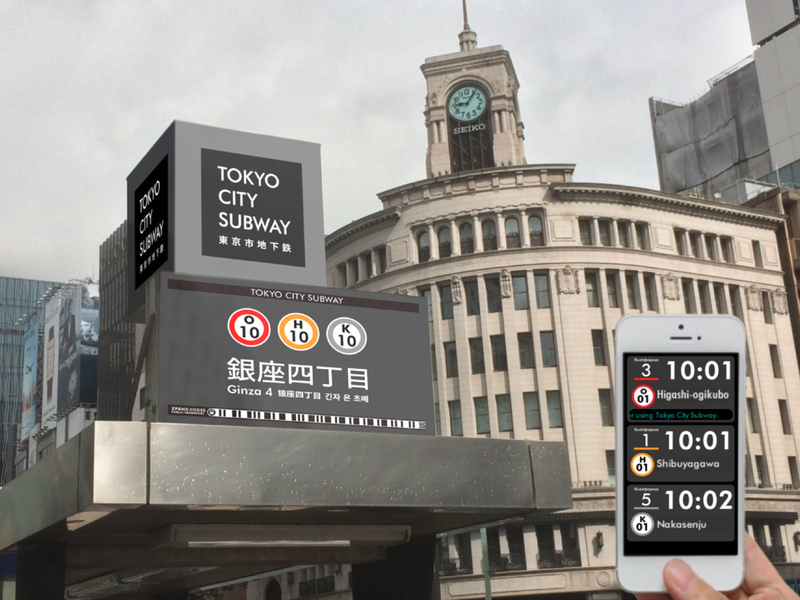 With the XPAND Code on signs that have to be read from a long distance and the QR Code on those that have to be read from up close, a single application will allow users, whether near or far, to scan those codes and effortlessly bring together signs (that is, the real world) and the internet. Naturally, the content to be displayed on the smartphones can be the same with both systems. “QR Up-Close, XPAND Far Away” will be the new standard for how we bring together the real world and the internet. D and the linked destination URL are connected on the XPAND Code server. Modifiable. XPAND K.K. owns the rights to the codes, and usage is offered for a fee. “XPAND Code Q”, which incorporates the QR Code, allows you to place a QR Code as well. Through this feature, you can　provide information both from signs at a long distance using the XPAND Code and from the documents in hand using the QR Code. There is a wide range of trigger technologies that use equipment set up to space to transmit data to smartphones. Optical triggers for the XPAND Code and the QR Code are a classic example, and when combining the codes with signs we believe that they are also the optimal choice in terms of reliability, cost, and legibility. Light ID is a method for transmitting data using the high-speed and invisible flashing of an LED light source. The light signal is received using a specialized smartphone application that directs users to the appropriate content. Since Light ID is invisible, a sign (that is, a sign for the original sign) stating that a Light ID is present is necessary. Since Light ID does not work well with black or other dark colors, design options are limited. There is not much research on the effects of Light ID ‘s high-speed flashing lights on human body. Since the Light ID reader engine is neither open nor standardized, the barriers to entry application and content creators are high. Acoustic ID is a method for embedding inaudible signals in a voice announcement to transmit data. Users would receive the sound using a specialized smartphone application that directs users to the appropriate content. Acoustic ID would require the user to hold the microphone on their smartphone toward the sound source. Acoustic ID is invisible, a sign (that is, a sign for the original sign) stating that a Acoustic ID is present is necessary. XPAND Code allows for a detailed customization, such as placing a different ID on the front and back of a sign or on signs at different locations, even in an area laden with signs like train stations. Acoustic ID application would require the users to hold the microphone toward the sound source, typically by holding the smartphone upside down, which could be a nuisance. Since the Acoustic reader engine is neither open nor standardized, the barriers to entry application and content creators are high. Beacons are systems where a signal is periodically emitted from a transmitter and received by the smartphone. The receiver, such as said smartphone, would then direct the users to the appropriate content. Since beacons use pull systems, when the information is provided may not be when the users actually want it. Since there is no need to worry about interference with the XPAND Code, fine customization like offering different content on the same sign (including on the front and back) is possible. Image Markers are invisible codes embedded within an image. The codes are read using a specialized smartphone app that directs users to the appropriate content. Since Image Marker is invisible, a sign (that is, a sign for the original sign) stating that an Image Marker is present is necessary. Similar to transit cards, general-purpose NFC enables information transmission at a few centimeters’ distance. The signal is read using a specialized smartphone application that directs users to the appropriate content. NFC requires users to be up-close, and is therefore incompatible with hanging or out of reach signs. An NFC-compatible smartphone is necessary to use NFC. 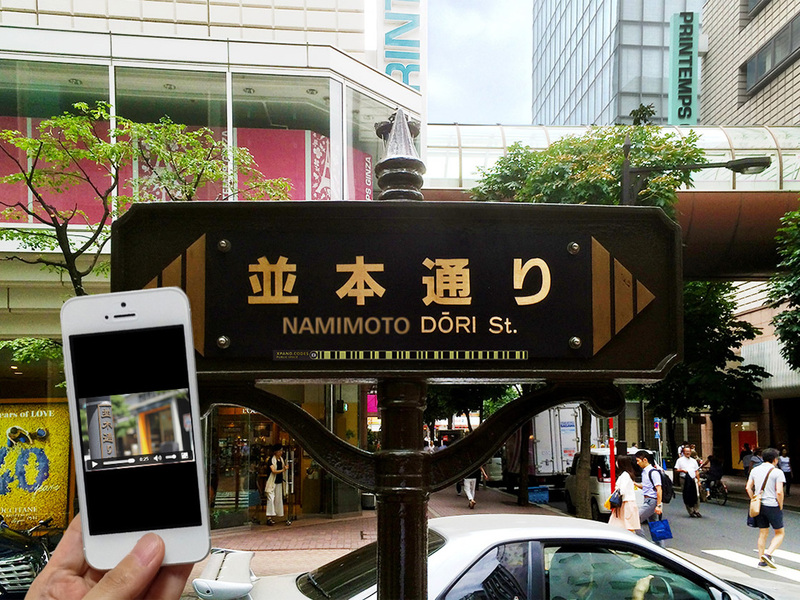 A single application can process both XPAND Code and QR Code, such that both systems can be used to cover signage near and far.